The end of summer signals a significant transition for you, your children and your ex. Parenting plans, that typically include longer parenting time stays at the non-residential parent’s home draw to a close and the school year schedule returns. What does this mean to your family and what have I observed over the years in my practice? During the return to school and normal parenting plan schedules, I often hear complaints about the other parent expressed. These range from inconsistent rules of the house to nutrition choices and homework. 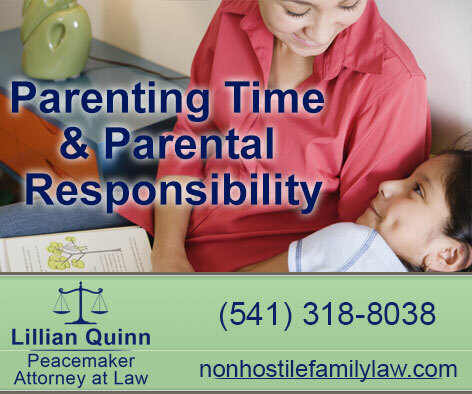 Ultimately, as a Central Oregon Family Law Lawyer, I have parents who want to discuss the responsibilities of the other parent and sometimes, what their options are to take them back to court. One of the most common complaints involve one of the parents becoming the “Disneyland” parent. They elect to avoid all rules, homework and do everything they can to win the children’s favor. This parent chooses to bend over backwards to keep the children happy, but they are really doing the child and themselves a disservice. The kids know immediately that they will be able to “play” this parent and will manipulate situations to their advantage. Even though children don’t say it, they crave discipline and order. The most successful parenting that I see following a divorce, is built on communication between the two parents. Even after a messy divorce, if you and your ex can put your differences aside to communicate about your kids and everything that goes with being a parent, including house rules, chores, homework, and sports, the more likely you are to reduce your stress and increase your children’s wellbeing. Simply sitting down to discuss what the rules are in each of your homes, even if they aren’t the same, can be very helpful in understanding where your children are coming from. If you are able to make the rules in both homes similar that is even better. For example, a consistent bedtime at both homes will lead to your children being well rested for school days and better academic performance for instance. Children, whether their parents are divorced or not, benefit from a team parenting approach. Probably the hardest thing for parents is the need to let some things slide. If a child returns from parenting time with dirty clothes on, it is not the end of the world. Did they have a great weekend? Did they feel loved and nurtured? Focus on listening to your child rather than being overly negative about their clothes or your ex. Instead of nagging your ex-spouse, tell them what a wonderful weekend your child had with them. You can catch a lot more bees with honey! Many hurt feelings are deep or too fresh for the team parenting approach to work entirely on its own. Parents often want to know what their options are for modifying parenting time, to enforce their rules in their ex’s home or dictate who their children are allowed to be around during parenting time. The courts are very specific on these types of complaints and will not get involved in parenting time issues unless there are real safety concerns and there is concrete evidence to prove them. For example, if you discover that your ex is driving drunk with the children, then you may pursue Court intervention and a change in custody and/or parenting time. The court only addresses serious safety concerns, they do not dictate bed times, whether or not homework is completed during parenting time or what sports your children are to be transported to. If serious safety concerns are proven, the courts will only address the related issues and will not consider any disagreements related to parenting style. Those are left for the parents to discuss and decide for their children. My advice is that you and your ex make a concerted effort to do what is best for your children. If you limit your discussions to only topics concerning the children, you may be able to communicate what is needed without conflict. Keep in mind that your children love both of you and need both of you in their lives. Ideally, you and your ex can be a team for your children. As a team player, your responsibilities as a parent during your parenting time will be open to discussion, but that doesn’t mean you have to agree. Simply sharing your concerns with each other in a respectful matter will positively impact your children. With the end of summer approaching, I hope you and your family are able to focus on returning to school and the normal parenting time schedule without any complaints!